Cat Chat With Caren And Cody: "Tears In Heaven"
Some of you might remember this post from last year. The only change I made was that Bobo is now gone 5 years. The above song was Bobo's "love song"....when thinking of what I wanted to write this year....all I could think of was publishing this post again. My Baby Bobo, I miss you today, I'll miss you tomorrow, I will miss you until the day we meet again. It is 5 years ago today that I lost my beloved Bobo, or my "Baby Bobo" as I often called him. Bobo passed the day after his 18th birthday. He was my "Soul Kitty". What is a "Soul Kitty?" A "Soul Kitty" is a once-in-a- lifetime pet. A "Soul Kitty" is the yin to our yang. A "Soul Kitty" is a pet tied more deeply to us than many people in our lives have been, or could ever hope to be. Our fur babies are ALL special but I believe if you think really hard there is just one who stands out from the others. A "Soul Kitty" is the one whose fur would be dampened by our tears as he snuggled peacefully by our side, just to offer us comfort. A "Soul Kitty" is the one who makes us laugh til our sides ache, watching his kitty craziness. 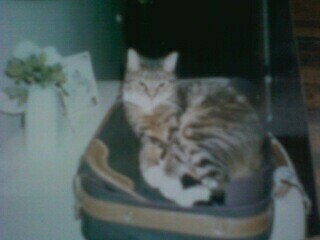 When Bobo was still a young cat, very much alive and vital, I often played music in the apartment that we shared. There was one song, "Tears In Heaven" by Eric Clapton, that for some reason Bobo particularly liked. Whenever it would come on he would come walking into whatever room I was in. He would rub his head and face against my hand or my leg. He did this so often that I began to call it "Bobo's Love Song" or "The Kitty Love Song" . I used to become sad thinking that one day, even if it WAS many years down the road, my Bobo would no longer be with me. Even with Bobo being so young the thought would bring me to tears. I couldn't imagine not having my "Baby Bobo" in my life. It's been five years since Bobo passed. For my Bobo and all of those one-of-a-kind "Soul Kitties" who lived their lives strictly for the purpose of loving US, thank you, you are missed and loved to Heaven and back. Mama's eyes are leaking. This is such a beautiful tribute to Bobo. The cat before me was my human's soul kitty, and she still thinks about her every day. Purrs to you. Such a touching tribute post, Caren *hugs* Bobo was so loved, and will be forever missed and never forgotten. You have done of amazing job of keeping his memory alive, and I'm so glad to have had the honor of hearing the story of your "Soul Kitty." This is a beautiful homage to adorable Bobo! I imagine he is playing with butterflies, among lovely flowers in a beautiful place full of lights! Awwww! Leaking here too. Can't listen to Clapton's song without tearing up. Not sure if I've had a soul kitty as I could never keep one for long enough. In the past I moved around too much to be able to keep a cat all it's life. Austin is lying here beside me. He has made it clear that he is my cat and mine alone. It is so endearing and quite touching really! @Sparkle, I would love to hear more about your baby, "purrs" to you too! @Fuzzy Tales thank you that was beautiful! @Caro, Austin must be your soul kitty! @Luna, funny you said that. One of the Anipals on Twitter "@supernatural808" made an avi of Bobo that I probably should have used. It has butterflies on it!! My mama's eyes are leaking now, thinking about your sweet Bobo and about the cat who came before me. Her name was Boo -- mama used to call her Booboo -- and she died two months before her second birthday of cardiomyopathy. It just about broke my mama but somehow she managed to open her heart again and I comed in. This is a beautiful tribute to Bobo, your soul kitty. You were lucky to haf each ofur. Awww what a lovely song for sweet and gorgeous Bobo!! I love this song - it's so sad and so poignant! I know how you feel, I miss my lil' Hooter every day. I was blessed to have her in my life. I think Bobo can still feel your love. @Old Kitty, I love it too, Bobo had good taste didn't he? Hugs to you and Charlie! Such a lovely tribute to Bobo. Bazinga got extra hugs and kisses today, to show her how much we love her because of your post. I'm so very sorry, Caren; I know too well how hard--and how bittersweet--this day will always be for you, as you're flooded with all those wonderful, impossibly-happy memories of time spent with your beloved Bobo... followed by the heartbreaking realization that those memories are all that remains. Your Soul Kitty is watching over you from Rainbow Bridge today (just as he does every day), I'm sure... with a contented smile on his face and purrs loud and strong... holding out his paw as though to blot your tears. Oh Bobo... may you rest in peace and play and nap with all the other beloved kitties that have also passed on. We are happy your Mom was blessed to have you as her feline soul-mate and had so many wonderful years with you. @Amin, thank you so much! @Sixties Vintage, so nice to meet you, thank you!! Receive our hugs! Angels never dies! What a beautiful tribute to your loved one. What a tribute to your soul kitty. That is how I feel about my Abby, so I fully understand, and I too know especially with her advancing age that time stays still for no one. I lose a little bit of her and I when we lose our furfriends. But we know that it is far better to know these feelings than to never have experienced them, so as with Bobo it is a bittersweet one. With great love comes great sadness. @The Whiskeratti thank you, he was a beautiful boy! Lovely tribute to Bobo, we are sure he is waiting at the rainbow bridge for you. And we are certain he knows he still lives in your heart. I understand, Caren. I'm coming up on an anniversary of that sort myself. I find that honoring their memory through sharing them with those who have never met them helps my heart. I hope it helps yours, too. What a fabulous tribute to Bobo CAren. Sometimes there are just those "extra special" kitties that come into our lives and no one else can ever fill their paws. Thanks for following my blog and for commenting! Sorry for the loss of your Bobo, 4 years ago. BUT being blessed for having such a lovely pet for 18 years is exceptional. I'm hopin that one of our seven felines will reach that age too! Dear Caren, First of all I want to give you a Hug and a Cuddle ( I promise no claws included ). It's a sweet tribute to Bobo. Even I didn't have a chance to know him, your "Soul Kitty", I love him too. and we love you. This post was beautiful, a heartfelt tribute to your soul kitty! Thanks for posting, it was a pleasure to read. Even though I love Moby to bits, I lost my soul kitty years ago. Thinking about her still makes me teary. A lovely tribute to Bobo, a real special cat. Purrs from all of us. This is a beautiful tribute. Isn't it crazy how much they are missed years after they are gone? Thank you for your comment on my blog today. It's nice to have someone who understands staying home with the cats! Most of my friends think I'm nuts. But the good news is that my AC finally bit the dust totally today, so I get a new unit on Tuesday (instead of yet another band aid - this is a yearly problem). For now, a window unit at least keeps the downstairs cool! Happy 4th!!!!! @Artemisia THANK YOU!! I know he watches down and protects us for sure! @OKCats thank you! Yes, it STILL hurts. You are welcome. OMG I understand but everyone thinks I am nuts too lol. I am sorry your AC died but thankfully you will get the new unit and you won't have to worry. It is so much nicer for us this year too (ours broke a month or so ago)...now that the new unit is in the temp is exactly where it should be! Thank goodness you have the window unit! Happy 4th to you too! @Benny & Lily thank you so much! @Mariette you are so welcome and thank you as well. You are absolutely correct that I was definitely blessed and lucky to have had Bobo for the 18 years that I did. It is amazing though that it all seemed to pass in the blink of an eye. I am following you so I will for sure stop and check out your feline section as well! Lots of love to you too! What a lovely tribute to your dear Bobo - 18 years is such a good age and he must have loved you very much. We are all sending hugs and kisses but Lucy says hers are the bestest ever in memory of your sweet Bobo. Oh what a beautiful tribute to Bobo - he sounds like such a wonderful kitty and I can tell how much you still miss him. Yes, every so often an extra special pet comes along that is unforgettable and when they pass we have an even harder time than usual. I lost my Abby in January and like you with Bobo, when she was just a young pup I found myself thinking how will I ever deal with it when she's no longer with me. I have lost many pets over the years and it is always hard, but Abby was especially so, as was Bobo's passing. I hope it gets easier for both of us as time passes. Oh sweet Caren, you musn't do that - make me unclued like that! (and oh no, not that song... can it get more teary!) As you know it was the New Year's story of you and Bobo that made me realize you how much of a kindred spirit you are. I KNOW it so deeply what you write about but can't bear speaking about it. I believe they are given to us like actual gifts from God. There for sure are those special ones that can undo us because of the direct access they have to our souls. I can tell what a blessing Bobo was to you. Hugs to you on this day of memory. P.S. Wrote a little answer to your question from yesterday on Gods Little People. @Hannah and Lucy...ohhhh please tell darling Lucy that I nearly cried when I read that! THANK YOU!! I love Lucy's kisses!! (Hannah's too!) Yes Bobo was so attached to me it was unreal. Even the vet commented numerous times that he had never seen a bond quite like ours. When I would have someone house sit when I was gone they would tell me that Bobo would wait by the door like a dog when he heard the keys, when he realized it wasn't me coming in he would leave and go into another room. Often he wouldn't eat for the first two days of my being gone. He was such a wonderful boy! 18 yrs is a very good age and I was blessed to have him so long. @Amin, you are welcome! Thank YOU! I guess I am lucky I still have my Soul Kitty with me at 20 - Chica. I know it will be hard to see her go. This was a lovely tribute to Bobo. Wishing you a happy 4th! Caren, what a touching tribute to your beloved Bobo. Soul kitties stay in our hearts forever. I lost a soul kitty nine months ago and know how it it feels. I hope you find peace today. Caren, soul kitties truly leave pawprints on our hearts forever. What a lovely tribute to your beloved Bobo. @Cats of Wildcat Woods, you are soooooo lucky to have your Chica with you at age 20!! Living til age 20 is rare indeed. You are both sooo blessed! Enjoy every moment! Thanks so much and Happy 4th to you too! Time goes by so fast, four years must seem like yesterday. I hope today is filled with memories of Bobo that bring a smile to your face. That's very sad about your cat. I never was close to any of my children's pets. I was too busy raising my children, but now I know I would be just heart broken if any one of my cats got sick and I lost them to death. I told my grandchild, "we just can't have another cat around our house", but what could she do when the neighbor brought this little homeless one over asking us could we keep it. Eileen Hi and thank you!! I am fine but have been super busy, how about you? I am lucky about the comments but this isn't the norm lol. It is my beloved Bobo that people wanted to comment about. I do have a number of wonderful people who read my blog regularly (wonderful FRIENDS) and I am beyond grateful for that! I am so glad you let your grandchildren keep the kitty!!! Just want to wish you and your loved ones a Happy 4th of July! What a touching, loving tribute for a very close friend. Bobo sounds like the best kitty ever. We send you comforting purrs as you remember your beloved Bobo today. What a lovely post Caren. Mom thinks you can have more than one Soul Kitty. She says in her life she has had the kitty she needed when she needed that kitty. Each has taught her something she needed to learn and all gave her love and she returned it with her full heart. What a beautiful tribute to Bobo and a such a touching story and post. I find that the space from a special soul kitty is never again filled even though we love the others so very much. Mine was Inka or "Girlfriend" her nickname, she passed away a year and a half ago. Clooney too was so very close to her and has not been quite the same since her passing. Sending you gentle purrs on the Anniversary of Bobo's passing. Now you made me cry :-s I'm way too senstive to read such a post. I know what you mean with a 'soul kitty'. Avalon is my soul kitty too. I'd give my own life for this cat and I'd be completely lost without him. ((((HUGS)))))) I know what you mean by "soul kitty"; Daisy was mine; I lost her to cancer 11 years ago, just a few weeks before her 18th birthday. Aw, such a sweet post. Lots of purrs for you and your soul kitty bobo. I'm so sorry about Bobo. He lived a long life, but our pet's lives are never long enough, are they? I wish they could live as long as we do. I lost my Ethan almost 5 years ago and I still miss him terribly. Bobo was a cute kitty. I know he looks down on you from kitty heaven and smiles. We never stop missing these soul kitties, and no matter how much time passes, these anniversaries are hard. Hugs to you as you remember our Bobo. Oh Caren...such a sweet, touching, lovely post. I've had many cats in my life but only a very few soul kitties and they touch us in ways we can hardly express adequately. We carry them with us always in our hearts and indeed one day we'll be together again so that much at least is a comfort. Special Hugs today to you from me and Sammy. That is one wonderful tribute to BoBo. We sure know what it is like to have a soul kitty. Our Person has had many of those. There are just some that are extra special. Glad you had BoBo. Take care. We NEVER forget soulmate kitties. Beautiful tribute! My heart is with you, Caren. 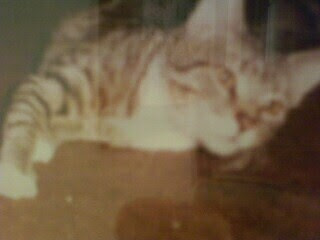 I lost my own soul kitty (at only 9 1/2 years old) in 2000, after a hard-fought battle with gastro-intestinal cancer. We never "get over" the pain, the feeling of so much loss, the missing them... but the love we shared, that indelible bond, is ours to cherish forever. What a beautiful tribute to Bobo. Bobo looks like my baby, Smoki. A lovely tribute Caren It brought tears to my eyes. I have a "soul kitty" too and have always felt so lucky to have found him. Oh Caren, what a beautiful tribute to s special kitty. This is going to stay with me for a long, long time. What a treasure...and so many wonderful memories you have. I suspect when Eric Clapton's song comes on the radio, there's an extra warmth in your heart...and a teary eye. You did a lovely post, plenty of feelings,a beautiful homage to your adorable Bobo. You are so very right about those once in a lifetime kitties. They enrich our lives yet break our hearts. It is best to remember they are ALWAYS with us! What a sweet and wonderful tribute to your sweet Bobo. Leaving you lots of warm, gentle hugs. Yep, I'm bawling right now. What a beautiful, loving tribute to your Soul Kitty. I am sure that Bobo still 'visits' you, even if it is only in your dreams. Soul bonds are like that. I did not know Bobo, but I do know how very special he was. He made my whiskers weepy wet and my heart smile at the same time. 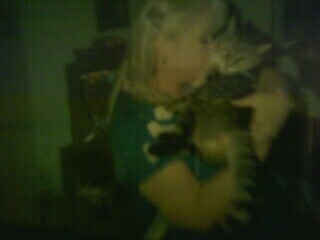 My Dad had a heart kitty too, my brother Ivan, who had a heart attack and died in his arms. We send you long distance hugs and maybe one day we can deliver it in purrson. We send you comforting purrs and hugs as you remember your sweet Bobo today. What a nice tribute to him. We can see how special he was. @Brian awwww you touched me so much. I am so sorry about your beloved Ivan as well. I can only imagine the pain you experienced. When we had to help Bobo cross the bridge I held him on our couch (we chose to have him at home) I literally collapsed in tears while holding him. I could barely let him go. His ashes are in a beautiful wooden urn on my desk with his photo on it so he is still with me every day. Yes one day maybe we can each deliver (((hugs))) in person. Thank you! @Deborah thank you!! I know you cherish him every day!! @Malia thank you!! Then I know that Smoki must be a gorgeous kitty! I understand a soul kitty.... that is what alex is to me... if you would have ever old me ,the dog girl, that I would love a cat as ,much as do him I would never believe you... but I do. And it is so hard to see him age so quickly and know what the future holds.,. When I was 12 years old I got a little puppy named Snuggles. She was my baby. She was my soul puppy :) She died ten years ago but I still remember all the fun things we did. I miss her terribly still. A wonderful heart-felt post, Caren. Those soul-kitties remain a part of us: no matter how many years they've been gone, it still seems strange not to turn around and see them there. Maybe that's because they still are, only in another form. Thanks so much. I feel so guilty, this post was from 2012. I looked and I am not sure that I have acknowledged the date since (on the blog)........I am certain Bobo IS still here in another form. Cody found Bobo's old carrier quite some time ago, (I had never shown it to him, I keep it in the closet). Cody found it, opened the door on it (himself!!) and often goes there to sleep. I think he is communicating with Bobo, I truly do. I wouldn't be surprised. They see more than we do. Angel Bobo is is the dearest. Me and mom are sending lots of love & Hug to you.